Windcrest Farm is a 14 acre USDA Certified Organic Farm and Greenhouse in Monroe, NC, located 35 miles southeast of downtown Charlotte, NC. 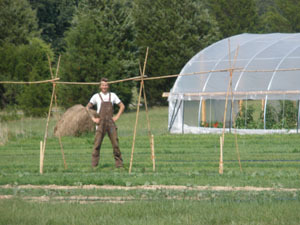 Established in 1978, our farm includes two production greenhouses, three high tunnels and two acres of cropland. Our products include organic vegetable, herb and flower transplants for market growers, CSA farms and home gardeners, fresh produce, cut flowers and herbs. Our markets include area farmers markets, restaurants and direct to consumer sales. We also offer seasonal educational classes and workshops. Available March 2016 through August 2016 for a minimum of 16 hours per week on-farm, including minimum 4 hrs. on Friday for harvesting.